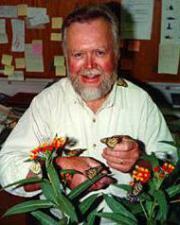 In 1992, Chip Taylor, Ph.D., founded Monarch Watch, an outreach program focused on education, research and conservation relative to monarch butterflies. Since then, Monarch Watch has enlisted the help of volunteers to tag monarchs during the fall migration. In this 90-minute webinar, Taylor will introduce you to how to create and maintain habitats for monarch butterflies, pollinators and other species that share the same habitats. At some locations, it may simply be appropriate to create demonstration sites with relevant signage. On other landscapes, it might be desirable to alter the present low diversity vegetation to increase its value to monarchs and pollinators. Taylor will present methods needed to make these changes. He will provide some estimates of costs of the various projects you might wish to undertake as well as discuss how to minimize those costs through selection of specific flowering plants and grasses. Trained as an insect ecologist at the University of Connecticut, Chip Taylor, Ph.D., has published papers on species assemblages, hybridization, reproductive biology, population dynamics and plant demographics and pollination. Starting in 1974, Taylor established research sites and directed students studying Neotropical African honey bees (killer bees) in French Guiana, Venezuela, and Mexico. Monarch Watch, founded by Taylor, has produced many new insights into the dynamics of the monarch migration. In 2005, Monarch Watch created the Monarch Waystation program, in recognition that habitats for monarchs are declining at a rate of 6,000 acres a day in the US. The goal of this program is to inspire the public, schools and others to create habitats for monarch butterflies and to assist Monarch Watch in educating the public about the decline in resources for monarchs, pollinators and all wildlife that share the same habitats. Excellent presentation on how to get involved with Monarch Butterfly enhancements. We have done pollinator gardens but milkweed is not an available plant to us. Helpful to know that some of the other plants that attract Monarch's, we have planted.